Drawn to the Caribbean by her degree in Environmental Science, 2005 Castleton University graduate Sarah Babin took her love of the earth and its oceans on a successful, yet unexpected journey. Following her passions, Babin now serves as the creator of TideBird Swimwear, a company she started after living for four years on the island of St. John, in the U.S. Virgin Islands. After buying a house with enough room to host her own studio, TideBird finally found its wings. Babin continued to hold a day job at the Nature Conservatory in Wilmington, N.C. while continuing to grow her thriving small business. “It was a slow process because I did it all on my own. 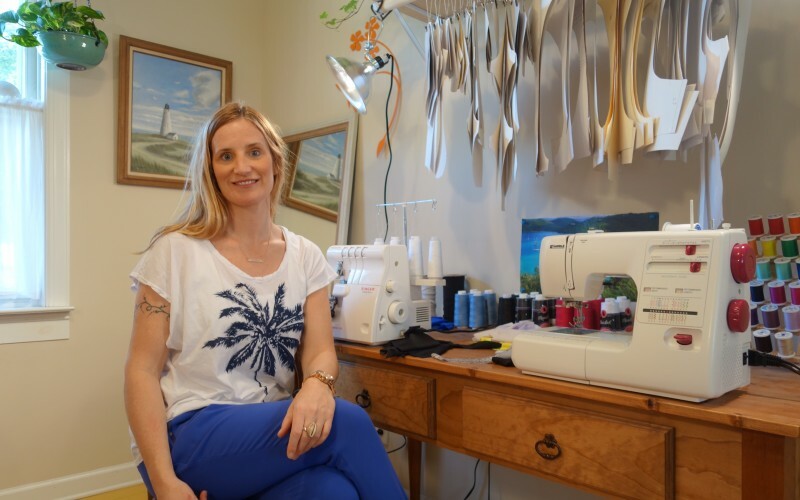 I saved for everything, it took a year to have a fully functional sewing studio, which I have always run out of my home,” she said, adding that start-up costs were her largest hurdle in her journey to create her business. Every bikini in the online shop is reversible and seamless and can be found on the TideBird Swimwear Etsy shop. Babin creates each suit by hand, made to order for each individual customer. Though her degree from Castleton University isn't put to use every day, Babin still believes a well-rounded college experience can help a person accomplish anything.